VINTAGE ANTIQUE DOUGH SQUEEZER / MAKER OR WHATEVER !!! Excellent condition Mosaic, only 1 piece missing. Missing back stand. See photographs. Inc.Vases, Plates, Ashtray, Etc. Quantity 15. Such a great reproduction candle snuffer. Scissor style candle snuffers like this are used like you would guess. Similar to a pair of scissors but to put a candle out without blowing wax all over. The scissor action doesn't cut the wick but smothers it. 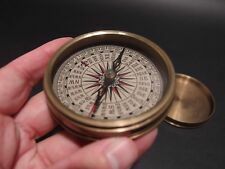 Nice reproduction of an antique compass. Great heavy quality piece made to look like an original! 3" Wide 3/4" Thick. A Lovely plate with a flower design and a lackluster finish. Ready to hang. Made In India. With 4 round glass with brass bar covered underwater viewing windows. 17.5" Wide (45cm). Antique Persian Islamic Damascene miniature brass casket with silver and copper overlay and Islamic text. Size 76 mm x 51 mm x 41 mm. An antique Art Nouveau French Alphonse Mucha style reclining lady resting against an outspread Ostrich fan. 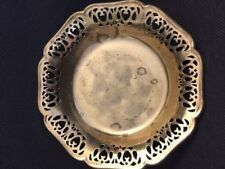 This interesting piece can used used as a soap dish, a trinket tray or just to look at! Made in cast quality solid brass. 9 1/2” to the tip of the pricket. Antique Brass Push Finger Door Plate Chinese Dragon Etched Signed Hong Kong. This is a rare find 12” long by 3” wide fabulous scalloped edges and hand etched dragon. There are surface scratches more on one side however it does not take away from the beauty of this treasure. It will be shipped in a very professional manner. This beautifully crafted piece was probably made by the Swiss artist P.W. Steinlin. Mid Century Modern. 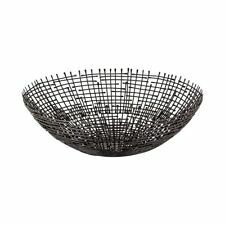 Iconic Bowl. weight: ca. 304 g.
Engraved: Paul Beuscher Boulevard Beau Marchais Paris. Ideal Gentleman's gift, useful desk tidy, fetauring Labradors head. DESCRIPTION This is Antique Brass Cylindrical Fukurokuju ojime. It's small but very refined. *There is a possibility that a color of the photograph and an actual color are somewhat different. Other ojime Other items!! Auction By It Now SIZE 1.5cm×0.9cm×0.6cm (0.59inch×0.35inch×0.23inch) total weight: 1g condition: used / There is an aged deterioration. The brass stand is 7 3/4ins x just under 5 1/2ins. 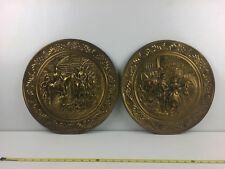 Antique 1930s Small Brass Etched Plate. Stamped made in India on the back. These 2" pins were used in the military, mines, gyms, swimming pools, etc. Twenty-two are stamped number 36 while three are stamped "A". Also includes two steel pins with a sliding bar?. They show a little wear but are still in overall good condition. Smaller is 2 5/8"T, 1 3/4"L X 1 3/8"W. Bases are felted. Pictures are included showing all imperfections we recognize. One pair of beautiful superior quality cast brass pricket candlesticks made by the Geddy Foundry, Williamsburg, Virginia. 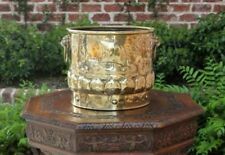 Simply put, they are of very good quality.Their design was copied from 17th Century English candlesticks in the Colonial Williamsburg collection. Jewelry Box Ornate China. Antique Solid Brass Dragon. Antique box whit incredible design of dragon on top and. jewelry, In very good condition you can see photo by photo. birds around of the box, this box normally they use to keep expensive. We recently acquired set from a high-end estate sale in Los Angeles. Pair is in excellent condition for age with no apparent breaks, dents or repairs. Note there is the expected amount of slight gilt wear for age…see pics. For Radio House" boat nautical. It is in pre-owned condition with normal wear from use and age, no cracks to the brass. 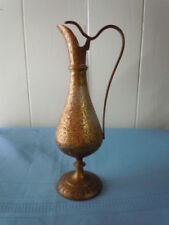 COLLECTABLE /VINTAGE / ANTIQUE WATERING CANS, one of a kind, A DECORATIVE PAIR. Period: Greek Age (6th-4th century B.C.). The prototype which it was made by is a museum exhibit. Material: BRONZE. The green / gold color is given through the process of oxidization. Shape and size may vary up to 0,5 cm because it is a handmade product. 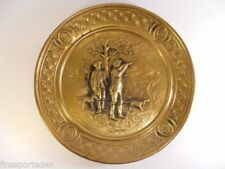 This is a nice piece of collectable Solid brass or Kitchenalia.